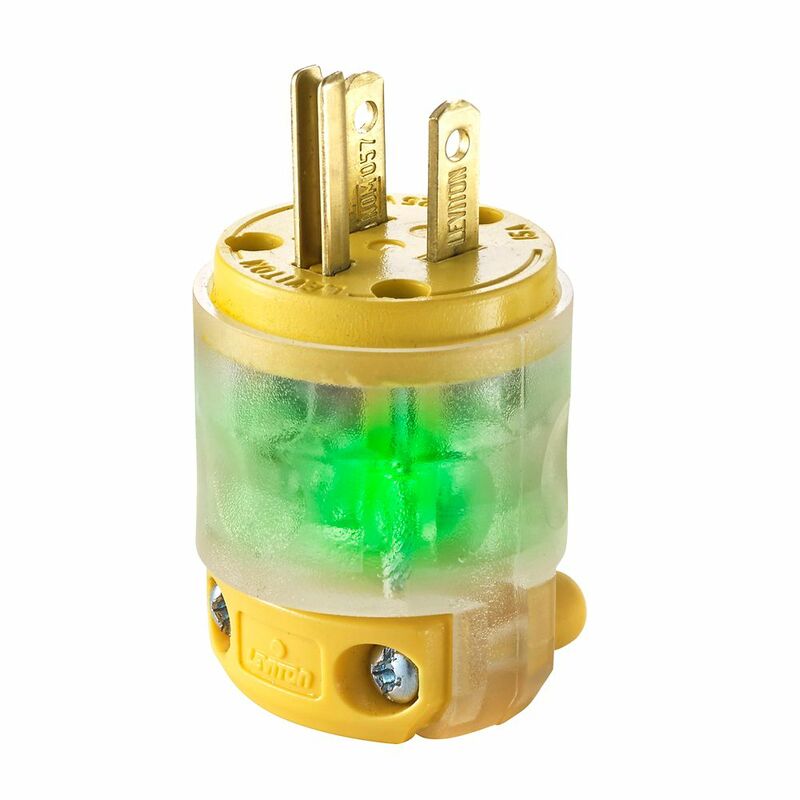 Leviton's Wetguard Yellow Rubber Plug has outstanding resistance to wet and damp environments, extreme temperature variations, acids, alkalis, grease, oils, and solvents. It also features innovative strain-relief that grips cables securely and keeps out water and moisture. 15 Amp, 125 Volt, NEMA 5-15P, 2 Pole, 3 Wire, Plug, Straight Blade - Clear with LED Leviton offers a large selection of 15, 20, 30 and 50 Amp Commercial Grade Straight Blade Plugs and Connectors, available in a wide variety of features. These rugged performers are moisture, chemical and abuse-resistant, And they're ideal for indoor and outdoor use. Our EPTR rubber-backed plugs and connectors stand up to rough use, protecting against dirt and moisture. The deep-slotted, backed-out terminal screws draw back wire clamps securely over stripped leads for maximum conductivity. 15 Amp, 125 Volt, NEMA 5-15P, 2 Pole, 3 Wire, Plug, Straight Blade - Clear with LED is rated 4.4 out of 5 by 90. Rated 5 out of 5 by Forex5x from I was able to put it on the cord and... I was able to put it on the cord and I believe it works well. Rated 5 out of 5 by cynthia from I replaced the plug on my electric power shovel with this. Now I know when there is current all t... I replaced the plug on my electric power shovel with this. Now I know when there is current all the way to the snow thrower. Fantastic!